Ricky Martin sent in this one. 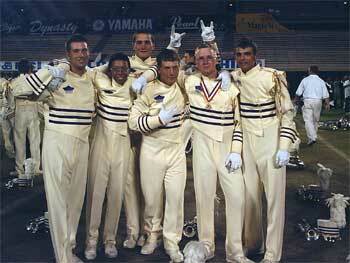 "This is a picture of five Carolina Crown trumpets on finals retreat. This picture was taken right after the playing of "America/O' Canada." From left to right, Steve, me (Ricky), Ben, Bob and Aaron. These are some of the great friends I made during my rookie year as a 15-year-old. It was the greatest experience of my life. I made a 135 friends from all over the world, I wouldn't trade a minute of it for anything!" Thanks Ricky!